The Essential Herbal Magazine is a print magazine by, for, and about herbie people and the things they love – herbs! You can subscribe at essentialherbal.com In the meantime, enjoy our blog! When I harvest Calendula flower heads, I leave a half inch stem attached, making it easier to press the whole flower face down on a screen for drying. As I flatten it, I gently break off the remaining stem. If the weather is warm, the flowers should be almost weightless, dry and crispy in less than a week. Each petal will shrink to half its width. You’ll be able to tell when they are ready. Once they are dry, hold the flower head and gently pull outward at the edges of the petals to remove them from the head. Calendula flowers dry beautifully on a rack or screen in a warm, covered, shady area when given plenty of air circulation. I press them onto a screen in our garden shed, and leave the windows ajar to promote air flow. A garage would work, or even a covered patio that is out of the wind. I sometimes notice bulk Calendula flowers for sale in natural food stores, stuffed in jars every which way, in a brownish tangle. They lack memory of the life force when handled that way. When carefully dried, they are a joyous addition to a summer Potpourri. it is most likely just a Calendula seed! Simply lift it out with tweezers or a spoon. It is easy to inadvertently pull a seed off the head when you are removing the petals. I found several the first time I made the infused oil. The seeds are a somewhat curly, crescent moon shape. This is my favorite method. Fill any size jar half full of dried Calendula petals. Pour Olive oil over the petals, filling jar to within 2 inches of the top of the jar. A little headspace is needed as the petals will expand once they become saturated with the oil. (an overflow is quite messy) Stir the oil and petals a few times. Cover the top of the jar with a double layer square of cheesecloth and apply the screw band (or a rubber band) over that. Place in a sunny, south facing windowsill for at least 6 weeks. Stir contents daily. Place dried Calendula petals and olive oil in a crock pot. I suggest you use a Rheostat/Light dimmer to regulate the heat setting on your crock pot. Alternately, take the temperature of the oil frequently, turning the crock pot on or off, to ensure the oil temperature is maintained between 100 and 110 degrees for several hours. The crock pot method works well, though the oil will not be quite as resinous as it would be using the solar method with a longer infusion period. I don’t use fresh infused Calendula oil in soap recipes, generally, though there is no reason you couldn’t. It is more work to make the oil, and the yield is not as good. But this is a special oil. Alcohol frees and dissolves the resin in Calendula, adding medicinal properties to the oil that you would not be able to access with water or plain oil alone. I’m including the recipe, while I’m up, because it makes a highly resinous, healing oil, courtesy of the late Michael Moore. He stated that most of the Alcohol evaporates during the cook. Some expert herbalists consider the scent from the trace of Alcohol remaining in the oil to be unpleasant. Others swear by this method. You’ll need to make that call for yourself. Want to try it yourself? Fill a food processor with cut Calendula heads. Little bits of stem are fine to add as well. Pour 1/8 to 1/4 cup of 100 proof Grain Alcohol over them. 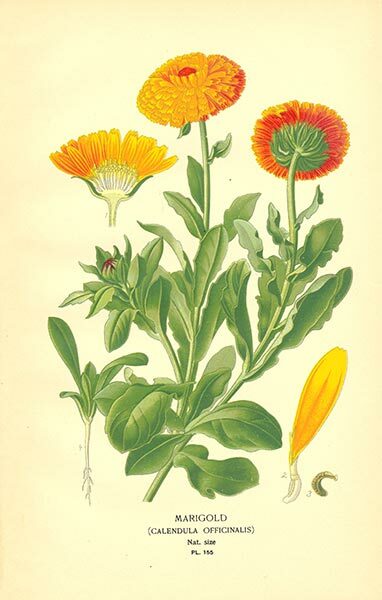 Process briefly, long enough to chop the Calendula and distribute the Alcohol. Allow to sit several hours. Transfer ingredients to a blender. Cover with Olive Oil. Blend on “Chop” until Calendula is finely diced. Scrape contents into a crock pot. Maintain temperature of oil & herb mixture at a range of 100-110 for 8-12 hours. Strain thoroughly through Cheesecloth or old t-shirt, squeezing every last drop of this incredible oil. 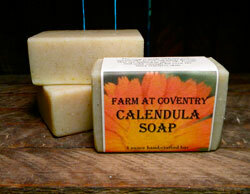 We make a scrumptious calendula soap if you're not inclined to make it yourself but need some! Click HERE! It isn't often that in the middle of working on getting an issue put to bed for the printer that something in an article makes us stop in our tracks and try it. Marita Orr from With Seeds of Intention sent us just such a project inside an article full of wonderful summer beverage recipes. The elderflowers are just starting to bloom, and so I asked her if we could publish the recipe separately so folks wouldn't miss their chance to make it this year. I started on it right away! 1 pound of white sugar, no substitutes!! Dissolve sugar in 1 quart of boiling water. Add rest of water. Slice lemons very thinly and add to water/sugar. Add vinegar and mix well. I used the removable crock from a 2 gallon oblong crockpot. Place elder flowers head down in a crock, large glass bowl, or non-metal pot. Pour liquid mixture over flower heads. Cover with a kitchen towel held in place with a rubber band. After 24 hours, strain through a fine cloth (I use a clean cotton diaper), bottle, and cork. So pretty it looked ready to drink immediately! Mature your Elder Flower Champagne in the dark for three or more weeks. It will be naturally fizzy when ready to drink, so watch out when you pop the cork! After 24 hours, most of the elderflowers are a little browned. It tastes very good (sweet). Because I can't follow directions very well, I was COMPELLED to ad a slice of lemon and a bit of elderflower. I also used Mason jars. It remains to be seen how that will work. I'm highly optimistic - as always. Actually, everyone *doesn't* know that. Many times in conversations over the last year or so, people become exasperated to think that people are not reacting to something in a way that they feel is reasonable. Certainly everyone knows about the ________ crisis (sadly, the blank can be many things). What is very easy to forget is that we are not all looking at the same things. Being very involved with nature, conservation, and all the areas affected, my friends are mostly aware of the same things that I am interested in. We all tend to worry a great deal about what fracking is doing to the finite amount of water that the earth holds (for starters...). We all hold the same sense of dread when the subject of the Tar Sands comes up. We think breast-feeding in public should be a non-issue, home-schooling is a-ok, and more than anything, we think that Monsanto is one of the biggest dangers to life as we know it that we've ever faced. But we forget that a vast percentage of the population is equally absorbed by other matters. There are so many important things happening, and for an awful lot of people just getting by, paying the bills, keeping a job, and getting from one day to the next is about all they can handle. We need to be more cognizant of that, and do what we can to share what we know without any judgment or anger. Taking an occasional job outside of my field over the years has opened my eyes to that fact with stunning clarity. So this Saturday, there is a worldwide March Against Monsanto. In the spirit of the above statements, I'd like to talk about it a little bit in case one person who didn't know, reads it. WHAT'S THE BIG DEAL ABOUT MONSANTO? Some of us probably remember during our school days hearing about new crops that would end hunger worldwide. Glowing descriptions of vastly increased yields, possibly even enhanced nutrition hailed the dawn of GMOs (genetically modified organisms) that would save the world. But why is it that country after country bans GMOs? Why are the test crops burned in other countries where the people are much more connected to their food sources? Closer to home, the question is, why are they fighting so hard to resist having to label GMOs in our foods? Corn is in nearly every processed food in one way or another, and just about all corn is now GMO. If they are working so hard on something so good, shouldn't they be proud of it? And then there are the small family farmers. You know... the people we used to call "the salt of the earth," the "heart of America." Well these hard-working folks who just want to put wholesome, sometimes organic, often heirloom variety food on our tables are systematically being run off their farms. It's intentional. Monsanto wants it all. "Farmers have been sued after their field was contaminated by pollen or seed from someone else's genetically engineered crop; when genetically engineered seed from a previous year's crop has sprouted, or "volunteered," in fields planted with non-genetically engineered varieties the following year; and when they never signed Monsanto's technology agreement but still planted the patented crop seed." Yep, it's true. A farmer who has maintained an organic, Monsanto free farm, whose crops are pollinated by wind or insects with GMO stock, can be sued and they will lose. They can lose everything because the wind blew in the wrong direction and a big powerful company wants it all. Then they came up with "Roundup Ready GMO stock." It just keeps getting better. The seeds are genetically manipulated (with all sorts of organisms; animal, viral, bacterial, etc.) and they are resistant to the herbicide Roundup so that when everything else dies, the intended crop will grow unimpeded. In response, we now have super weeds that have mutated to resist the poison. More and more poison is poured onto the fields and taken up in the groundwater. Insecticides are also being used in the same ever-increasing manner, producing super bugs and it is strongly suspected (okay... pretty much certain) that the disastrous and horrific bee colony collapses are the result. Oh, by the way, do you know who makes Roundup? Monsanto does. Not enough? Well there's more. We didn't really think we could destroy every other form of life and humans would be spared, did we? Now, a new study published in the Journal of Hematology & Thromboembolic Diseases indicates that the biopesticides engineered into GM crops known as Bacillus Thuringensis (Bt) or Cry-toxins, may also contribute to blood abnormalities from anemia to hematological malignancies (blood cancers) such as leukemia. [i]"
Roundup (glyphosate) has been linked to Parkinson's Disease, autism, cancer, infertility, and allergies. So there's my piece. I could go on and on, but hopefully have inspired you to do a little digging around if your curiosity has been piqued. I'll be joining a local march on Saturday. I hope to see you there. 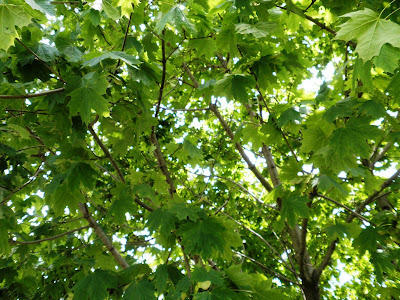 Maple trees are common and we almost don't even notice them. In the early spring, sugar maples are tapped for their sweet sap, but otherwise their usefulness and beauty is pretty much taken for granted. 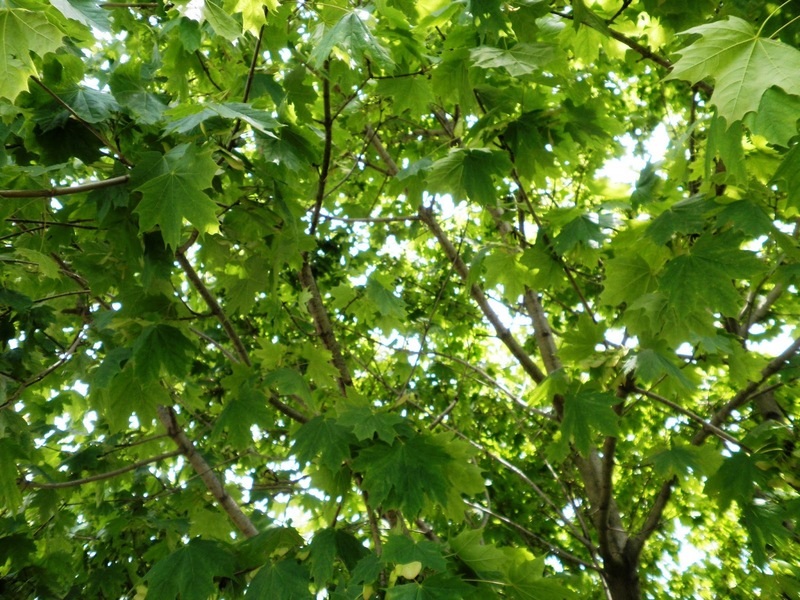 Walking up the back steps after working in the yard today, I paused in the shade of the maple tree and thought back to other maples I've loved over the years. Growing up, we lived in an old farm house with 2 giant maples in the front corners of the house and a third along the side. They stood guard over the house with their leaves swaying sweetly in the summer breezes. We didn't have air conditioning, but the deep shade offered by their dense growth made it bearable. The trunks of those trees were immense and their canopy met over the top of the 3 story house. In the side tree, my brothers built a tree house. It was higher than the second floor bedroom windows. Looking back, there was no adult supervision and the safety of this structure built by kids of around 12 was never checked out. Boards nailed to the trunk were the ladder. It was a little scary to be honest, but on the few occasions I found the nerve to climb those boards and rest in the middle of the tree were magical. The swaying branches with the leaves singing gently in the moving air mesmerized me and allowed my mind to wander unfettered. Those trees were as much a part of the house and our childhood as any wall, window, furnace or pipe. Later, when my daughter was little, we lived in a house with a row of large maples between the yard and the road. Many hours were spent watching the trees dancing in the wind, and she named them all "Maple-y." We watched the moon sail between the upper branches, and thrilled in the spring to see them quickly go from bud to leaf. Eventually there was a rope swing hanging from the largest tree, and she loved to play among the exposed roots and trunks on hot days when the shade welcomed her. As soon as this house was built, a maple tree went in. It now shades the kitchen and one side of the deck in the morning. The branches tickle us as we go up the steps. 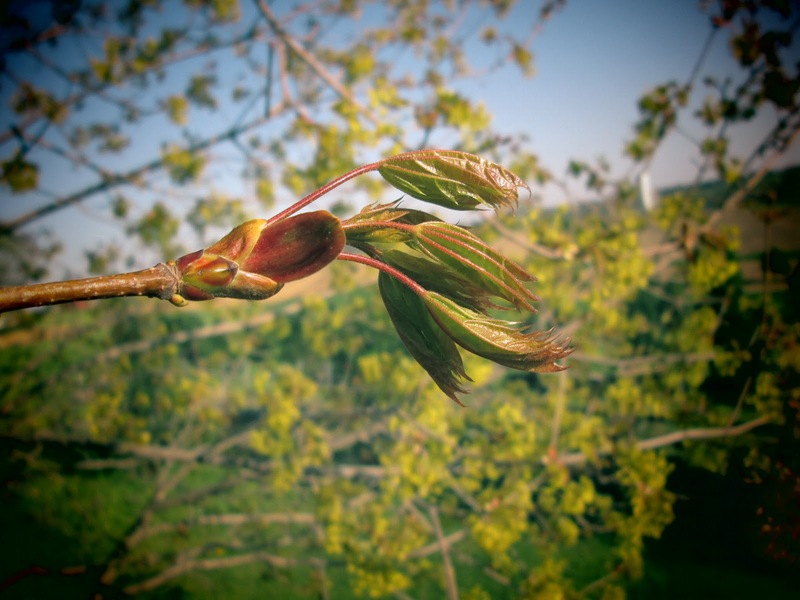 As each season passes, the tree trumpets its arrival, changing leaf color, dropping leaves, swelling buds, blooming, leafing out in the brightest of spring greens, and finally settling on a deep cool green before starting over again. Each of those colors and seasons changes the whole feel of the house. Spring green casts a cheery glow in the morning, and walking into the kitchen to make coffee just makes me happy - right off the bat, first thing in the morning. 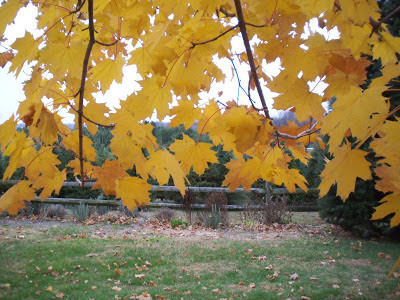 The clear, mellow yellow of autumn does the same thing, but brings a certain coolness with it. The shade in the middle of summer is a blessing that cannot be matched. Even in the dead of winter, I can see where the buds will be swelling in a month or so, and am warmed at the thought. Ice sometimes clings to the branches in a stunning display. When a friend from the city visits, we find ourselves sitting beneath the branches in the grass, talking quietly. It is simply always beautiful. So often with herbs, the question, "What is it used for?" comes up. Before writing this, it crossed my mind to put together some medicinal or culinary uses, or maybe a craft using the whirling seed pods, but that would be overkill. This tree is used for comfort, joy, beauty and as an anchor in time and space. It doesn't really need to be more than that. 6 issues per year. Subscribe Today! TEH Display Advertisers - Check them out! An' May It Harm None!